It is very much easy to find out a company information. If you have correct name of the company, then you can find out all relevant information of the company. Here I am giving the information in step wise with the assumption that you have company name. You can simply type MCA in google and go to the MCA website. 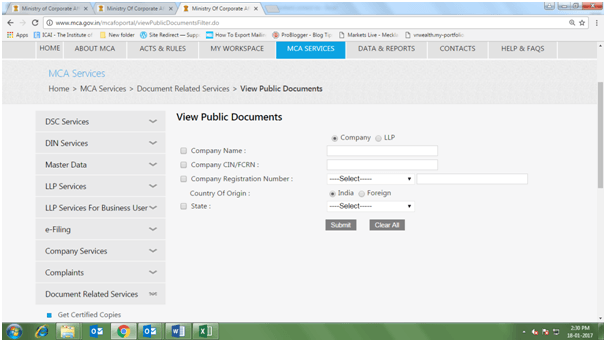 MCA is website of Ministry of corporate affairs, which maintain the data of all companies online. In MCA services you will find the various services provided by the MCA. Put the mouse over MCA services TAB. 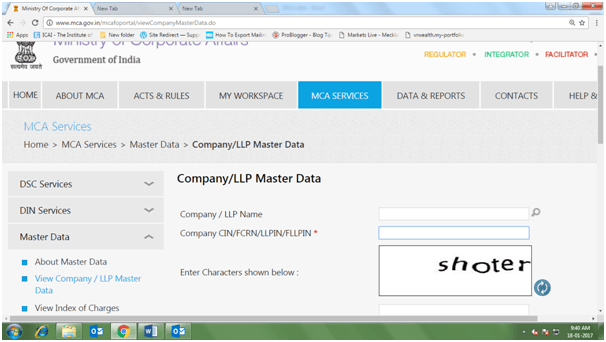 Then, you need to click on “View company or LLP Master data” Tab as given in the below picture. You will be taken to below given screen. Now you have to find out the company CIN number. CIN (Corporate Identification number) is a unique number given by the MCA to each company. 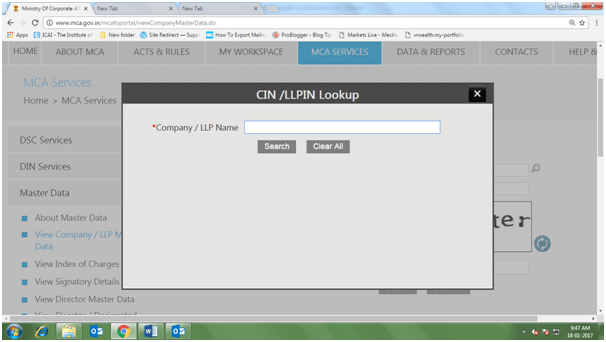 In MCA you can search data with CIN, easily. 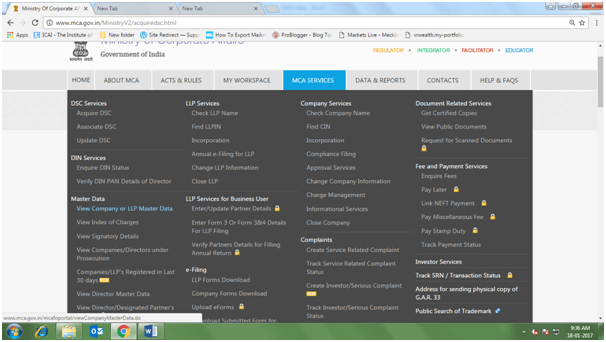 Now click on the search sign given in fort of Company/LLP Name. You will be taken to below mentioned screen. Here you need to fill the company name in CAPTAL letter and then search. You can fill the one word of company name or full name. The results will show the various options if you fill some words of company name. 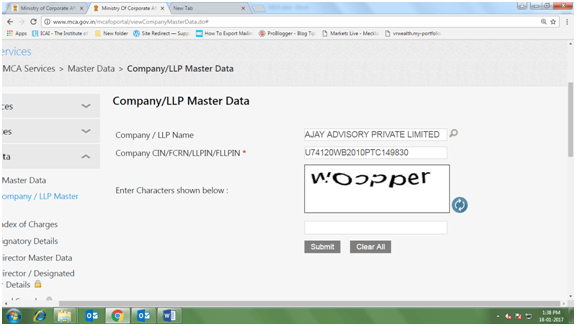 For example, if you are searching for a company with Name “AJAY VIJAY PRIVATE LIMITED” and you search only with AJAY, the result will show all companies starting with word AJAY. Then you need to select the desired company. 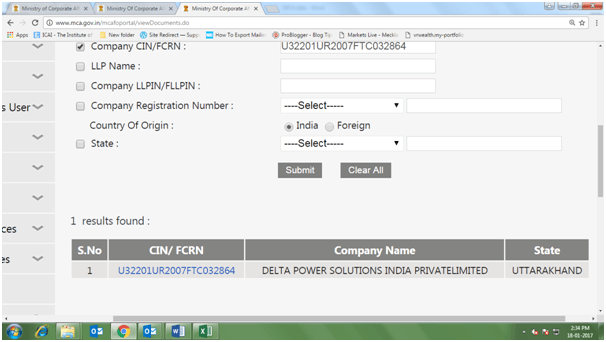 It will take you to the back screen and automatically fill the company name and CIN number as given in below picture. Now fill the character shown and submit. 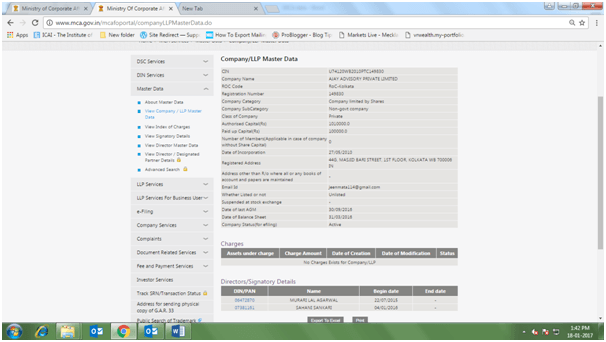 Now you will get the master data of the company with director details as given in below mentioned picture. Details of charges: if the company has taken any secured loan then that will be charged against property of the company. Same will be reflected here. Director details: It include details of all present director like their name, DIN and date from which they are appointed as director. Here you can find more details of other companies in which they are directors by clicking on their DIN. If the above information is not sufficient for you, then you will have to follow more steps given below. If you are new to MCA then register to MCA website by clicking the register link given in top of home page.Then fill the details required as given in below picture. 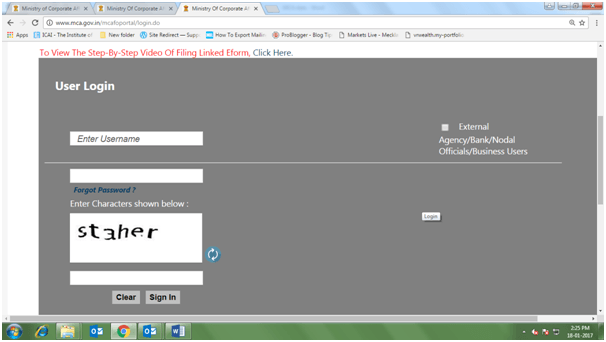 You can choose user category as Registered User since a business user require digital signature. Login to the MCA website with the link given in top of HOME page. 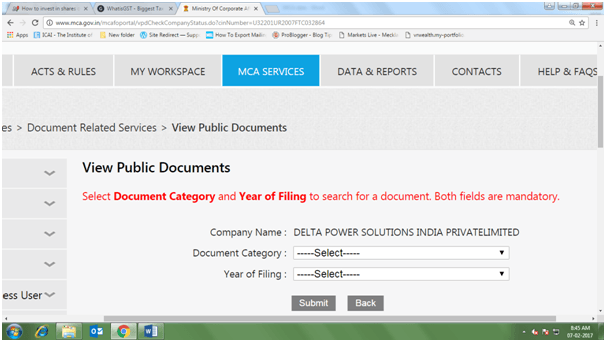 Just put your mouse over the MCA services TAB given in top, you will find view public documents tab there. Click on it, you will be taken to new screen. Here you need to fill the company name or CIN. If you are not able to find the exact name of the company then follow step 2 given above, you will get there company CIN. So tick the CIN field, fill the CIN and submit. It will show results at the bottom. 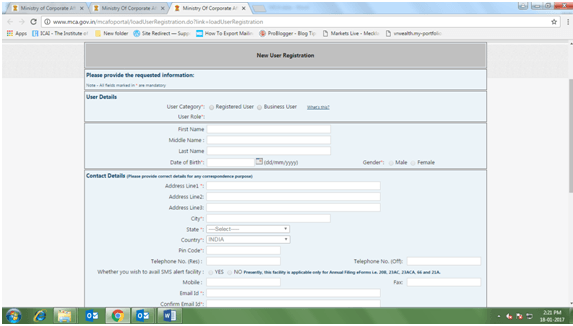 Click the company CIN (blue colour link) of the company, you will get the below screen. Here it is asking you to choose the type of documents you wants to extract. If you want to download the balancesheet, then choose Annual return & Balance sheet eforms. Then select the year for which you want to check the balance sheet. And finally submit. It will show the available results. This means the information you are seeking are available. Now you can add this company your cart and make payment. There is nominal fee of Rs. 100 which you can pay through by various mode like credit card, internet banking etc. There is also pay later facility where you can book the company now and pay later. But you can only download the documents after final payment. One payment is made, you can go to “MY WORKPLACE” tab on top. There will be list of companies for which you have made the payment. You can click on it, then all the documents will be displayed where you can download them. Note: Documents will be only available for Three hours from the time you first click the company name. You should know that documents will be downloaded in PDF eforms. In these eforms you can find the attachments. Suppose if you want to download balance sheet then you need to first download form AOC-4 or 23AC (old forms). There you will find the balancesheet as attachment. Note: Sometime you may find difficulty in downloading the eforms. You may try different browser (internal explorer is suggested). I am delhi university student in The final year of graduation. I have not enrolled for IPCC yet. When can I enrol directly for IPCC? what is the procedure and fee structure? Dear you can visit the ICAI website and check all details there. You will find every details there. Best of luck. Interesting info. I thought balance sheet is internal matter of a company. So never thought of downloading it. If i view the balance sheet of a company, then is the company notified about it, and my details provided to them? Sir, how can I find total profit of a company of 16-17 financial year? How can find brand value or total value of a company?